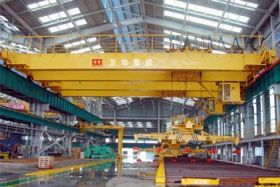 General bridge crane is a main product developed and manufactured by Weihua. It is mainly used in the workshop and warehouse. 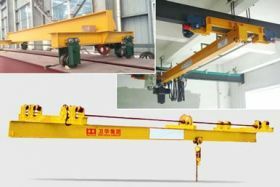 As a professional crane manufacture, Weihua Group has ability to design and manufacture non-standard bridge crane. 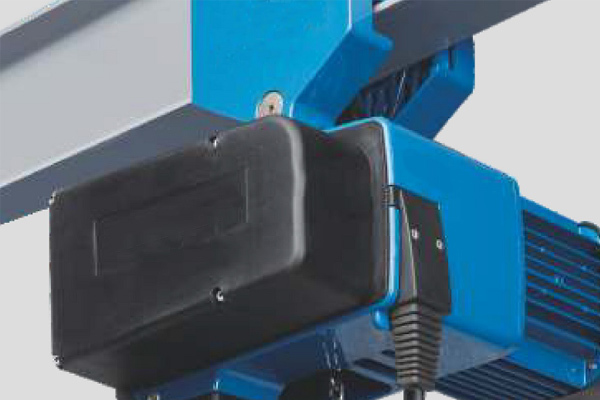 Here is a simple introduction to general overhead crane traveling mechanism. General bridge crane traveling mechanism has four traveling wheels (larger tonnage crane has eight traveling wheels, now we take four wheels for example), which are mounted on both ends of the two ends of the beam. Two wheels are active and two passive. Active wheels driven mechanism are separated drive, i.e., using two symmetrical independent driving, mounted on the crane down stage. Reducer is Hermetically Hardened reducer (accuracy grade 8-7-7). The lubrication of Internal gear reducer And bearing are of oil-bath lubrication. Oil level gauge and vent hole on the gear position facilitate for routine inspection and maintenance. All agencies adopt rolling bearing. Structure type of brake is single putt block type. The brake wheel surface is of good wear and impact resistance, excellent thermal performance, smooth friction surface and free of defects. Friction linings are in good contact with the brake surface. Good wear resistance, and easy to replace. All gear coupling connection for the bridge crane body parts. Thus, it will get compensation for the errors in the manufacture and installation, or displacement between each parts because of the bridge load deformation. Cranes active and passive wheel axles are supported on the angular Bearing box, which is easy for assembly and disassembly and repair.